Last week was full of activity at the Club. It started last Tuesday with the Melbourne Cup Luncheon which was beautifully catered for by Estelle Perry and hosted by Kevin Gibb. That evening was the start of Corporate Bowls. Barry Jackson had the pleasure of scoring a Hole in One on number 8 Hole this week. 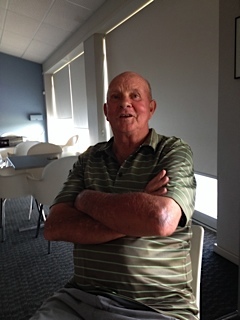 Barry who has a very good firsthand knowledge of the course to which he commits much time and energy said, “I just played my shot off the tee and thought it might be close”. Jim Parry, his playing partner, said, “ We had to wait until we got on the green and were all pleasantly surprised as our eyesight was vindicated to see the ball in the hole! It was a good way to finish the season on a high!” Congratulations, Barry. Wednesday evening was Corporate Bowls. Thursday Social Bowls had 38 bowlers in attendance. Friday morning was Croquet followed by The Drifters that night. The Drifters put on a great show and had the crowd up and dancing. Billy Washington and the band commented after the show how great it was having such an appreciative and friendly crowd to play for. This week the jackpot will be at $300. Thursday is the Seniors “Have a Go Day” (flyer attached). Friday night dinner is on with Steve Reagan cooking up a feast for all to enjoy.Dinner Menu 14 11 2014 Bookings can be made via phone, email or the foyer booking sheet. Come along, enjoy a great meal with friends and support the Club. The Men’s Golf Section will be holding their AGM on Wednesday November 12 2014, commencing at 10 am. This will be followed by a 10 hole golf competition. After golf there will be the annual major trophy presentation. Any member of the Club is invited to attend. A nomination form, to fill committee positions for 2015 is on the Men’s Golf section notice board. All golfers are requested to consider a position on the committee.